This film may have been falsely advertised as the story of Hercules going through the 12 labours. Instead that portion of the film is done within the first few minutes of the film in flashback. The rest of the film is, instead, based on the graphic novel Hercules: The Thracian Wars. In this time, the people believe in mythical beasts, like centaurs, three headed dogs, and dragons with multiple heads, and a half man, half god capable of slaying these mighty beasts. A wild story about Hercules’ legend, perhaps just half truths, is all it takes to put fear in his enemies. Instead of a half god, half man, Hercules is just a man. A very strong man, but still just a man. His legend grew after picking up talented warriors as sidekicks and friends. They are revealed to have been an essential part of the Hercules legend. With a little help from his nephew Iolaus (Reece Ritchie), a strong storyteller, Hercules’ legend is spread everywhere they go. If Hercules did in fact complete the 12 labours he did so with the help of his companions. After having supposedly endured these 12 labours, Hercules is accused of having murdered his own family. He woke up to find them dead, with no memory of what happened. With his legend now tainted he works with his friends as a mercenary. After being called by Thrace's Lord Cotys (John Hurt) to aid in battle against Rheseus (Tobias Santelmann) and his army, Hercules and his companions must train Thrace's incompetent army. The only thing missing from the training scenes was the song "let's get down to business" from Mulan. Winning the battle isn't the end of the film though. A twist comes later in the film and Hercules and company have a new battle to fight. The acting isn't always great, and the highly CG’d intro is worthy of eye rolling (the effects throughout this film left a lot to be desired). Worse yet, this is one of those films that attempts brutal action sequences while maintaining a PG-13 rating, meaning much of the action is not shown. It's often feels over edited, as if you're watching the edited for TV version, just so that it can reach a wider audience. However, the film does surprise by telling an interesting version of the Hercules story, with a twist or two. The problem is that while it's about Hercules and his fascinating group of companions, very little of the film is interested in these unsung heroes that helped make the Hercules legend. We do get some background on them, as in how they came to be with Hercules, but other than that we don't know them any more than anyone else we meet in the film. Hercules' aforementioned cousin Lolaus is particularly useless. His character lifts out of the film with no consequence whatsoever. Rufus Sewell's Autolycus is the apparent Han Solo of the film having taken the money and left the others only to return in the knick of time and deliver a line that's something to the effect of, "Yeehaw, now let's get out of here!" 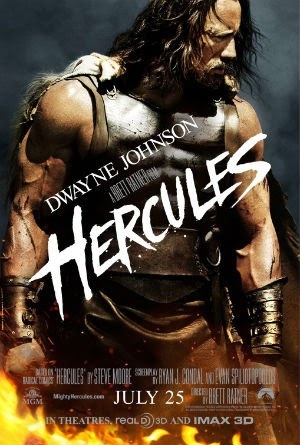 Overall I'd say it wasn't quite as bad as I expected it to be, but Hercules still just isn't very good. Perhaps that says more about my expectations than it does the quality of the film.